Believe me, it took me some courage to go into a place that offers food alternatively described as “nourish bowls” or “Buddha bowls”. I’ve a deep suspicion of anything that promises to do me good. But I’m delighted I went into Grounded Kitchen, a new takeaway and cafe on Queen’s Road, Clarendon Park in Leicester. They have started with a simple offering of three dishes – Korean-inspired salads that combine avocado, cherry, tomatoes, carrots, peppers, cucumber, chestnut mushrooms and spring onions, served on short grain rice and with Asian style dressings plus chilli, chia seeds, corianders and sesame. There is a veggie option and those featuring bulgogi chicken and beef bibimap. I had the chicken and it was great – really lovely flavours and good fresh ingredients. The place has the Clarendon Park types swooning (though there’s a faction that are campaigning for brown rice of course), and with good reason. I may be a health food sceptic but I’m very happy to eat this and look forward to forthcoming salmon and gochujang (Korean chilli paste) dishes. The restaurant is an initiative of Oadby lad Ahmed Kidy, who has spent a lot of time working and travelling in the far East and has had help developing recipes from Korean pals. He has also developed a range of Japanese matcha and sencha teas, including those steeped with the likes of mint, lime and spinach – this is definitely an alternative to the coffee culture on the rest of Queens Road. If Grounded Kitchen continues its early success, we could be seeing more branches appearing soon. While on the subject of pizzas, which we kind of were, Leicester’s Queen’s Rd looks to be getting a new Italian restaurant. Don’t know any more about it yet [Edit 15 June – It’s Leone’s, relocating from further up Queen’s Rd) but it will be adjacent to tapas bar Barceloneta in what is now Sansome’s bar. It’s a regular topic for Clarendon Park’s chattering classes why no-one has ever created a bar or restaurant in this space that the community has taken to its heart. There’s always scope for a good restaurant on Queen’s Rd and hopefully this will be a good independent operator. That said, I went to Pizza Express, (Kings St branch)at the weekend and was pretty pleased. My chicken and pesto pizza from their romana range was great, big and inviting, but thin and crispy. And well done to them for catering properly for coeliacs. I know some people are convinced wheat allergy is some kind of middle-class fad but to see my friend – who would be seriously poorly with one bite of regular bread – tucking into the very rare treat of a pizza and a beer was a real pleasure. Probably the nearest restaurant to my house is Barceloneta, the tapas bar on Queens Rd run by Leicester legends the Hussein brothers. It’s been there over 20 years and has all their trademark flair, yet the food tends to divide people and that’s partly why I’ve not had the chance to go for several years. Having seen a colleague give it a good review in the new issue of Great Food and liking the look of the specials pasted on the window whenever I walk by, I thought it was a good time to pop round and celebrate my birthday. Sadly the “Sunday before Bank Holiday” phenomenon caught us out and and it was fully booked. So sorry then, but no review. However, we did get into the neighbouring Queen’s Tandoori – a venerable place, recently taken over by new owners with a long track record in Leicester. Now I was a regional newspaper restaurant critic for five years and my heart used to sink slightly when asked to review an Indian restaurant. Not because I don’t love the food, its just that most conventional British/Indian/Bangladeshi restaurants manage to achieve a consistent level of reasonable food and it’s hard to find much of great interest to say unless something goes very wrong. And besides, I think people tend to just find a place they feel comfortable with and that becomes their reference point for Indian food – if you like the lamb bhuna at the Star of India, nothing I say about a similar place round the corner is likely to make much difference. So if I don’t say too much about Queens, it’s in the belief it’s just not worth saying too much beyond answering the question was it ok? And the answer was, yes it was. Prawn puree was very nice thanks, in fact the bread, like the chapatis we had later, was pretty impressive. A lamb tikka starter was also good. Service was friendly, maybe a bit slow – they too were busier than I think they were expecting and some spillage on the table never got cleared up which was mildly annoying. A main course of black pepper chicken was well-spiced – fragrant, distinctive but not overpowering – though I think the menu, or staff, might have made clear it came without sauce. Fortunately we had enough gravy to wet it a bit from a paneer curry and an aubergine massala side dish. Both these dishes were fine – aubergine was well cooked and the paneer was good quality. So not much more to say. A neighbourhood curry house producing good, enjoyable food in the style Brits have come to love. Doesn’t break the mould, may not convert you from your favourite place, but can be visited in confidence. I turned 50 this weekend and had a splendid celebration at Kayal in Leicester, but I’ve written before about the great food and delightful service there so I’ll just give a quick mention here of Dos Hermanos, where I celebrated on Saturday lunchtime. Food bloggers know this title as the blog/site of the Majumdar Brothers, acerbic but compelling Welsh/Bengali restaurant critics. For Leicester people the eponymous two brothers are the equally multicultural Husseins, who have given the city some its finest bars and eateries over the last 20 years. Dos Hermanos is their Cuban-themed bar on Queens Road, next to their tapas restaurant Barcelonetta. In the evenings it’s a busy, stylish but down to earth bar with a great line in cocktails and at weekend daytimes it is justly celebrated for its breakfast and brunchs. My ususal weakness is the hangover-bashing corned beef hash or the spicy huevos rancheros. This time though it was Full Montys all round. Ordering can be a complex business as the combinations for this put- it- together yourself breakfast are almost infinite. 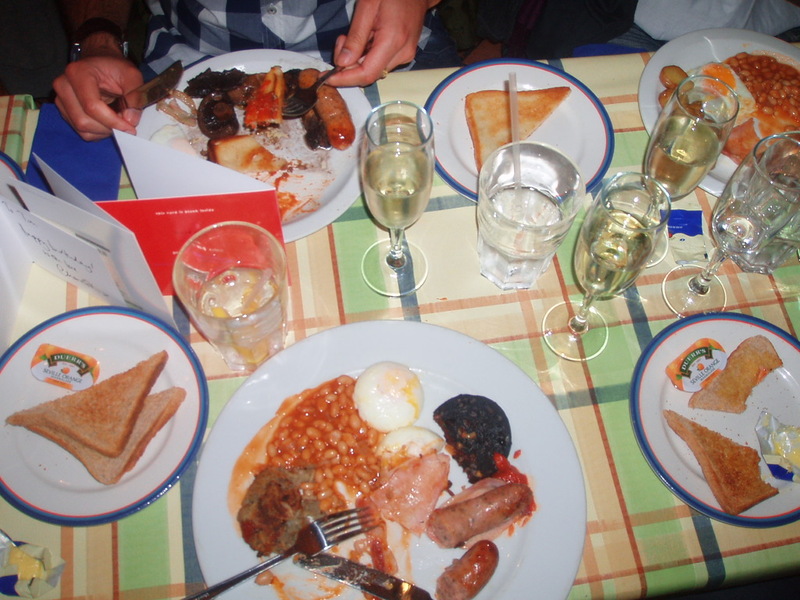 As far as I remember I had two plump pork and leek sausages, two rashers of excellent dry-cured smoked bacon, two poached eggs, a superb homemade hashbrown, a sizeable puck of black pudding, house-cooked beans and brown toast. Homemade ketchups completed the picture. The meal trod the line perfectly between having high quality, well-cooked ingredients and not messing with the essential down and dirty appeal of an English breakfast.